Cut from Green, unseasoned Oak. Oak will split and move to give a beautiful rustic appearance. 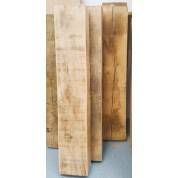 Posts will be planed to bring out the beauty of the natural figuring. We can provide these in 2 sizes from stock as chosen above. We can do other sizes on request. Post will have a 4 way weathered top, with 3 machined reeds below it to detail the top of the posts. We have taken a picture of one of these posts which has been treated and is in situ so you can see the appearance that this achieves. This listing is for 1 post. If you need a pair, you need to buy 2.